Founded on 8/10/09, Antique Ivy is an RP community about the residents of the school known as "Antique Ivy". Follow their lives for fun, excitement, and ridiculousness! Click "First Entry" on the right to start from the beginning or to our "Website" above to find specific stories, art, videos, and games! Introducing AI Mini-game: Anyo's Love! Featuring AnyoxLeo and 3 endings. Look over the README for all the commands, but basically, you can go to the menu using ESC or right-click and save/load. 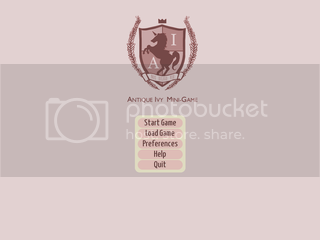 You can also fast-forward by clicking skip. Generally, you left-click to move along in the dialogue. Have fun and please tell me if you find any bugs! 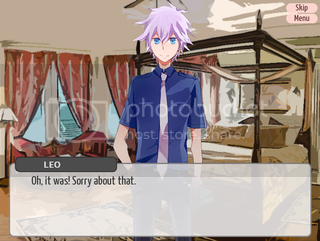 Bad Ending: Be mean to Leo every opportunity you get. Anyo's Ending (Normal): Think about what Anyo would do. Leo's Ending (Best): Think about what Leo would want of Anyo in an ideal world. Special Ending: Try to see a pattern in the choices you're given. There are multiple ways to reach some of these endings, but here are one of the ways for each. "Sorry, I was worried about something else…"
"No, I want you to keep the deformed Leo doll!" "Sorry, but I love someone else"